When it is recommended to use fiber optic? Places where there is a lot of electromagnetic interference due to the presence of machines, motors, three-phase power and high voltage cables, optical fiber is the only recommended option as it is made of insulating material. In addition, only light beams travel through it, making it totally immune to electromagnetic interference. Another great advantage is no need to use a separate wiring conduit for data, as fiber optic cables can be passed through the same ones which high voltage cables are passing. When cameras are installed far away from the security room, as above 1,500 or 3,000 ft. (500 m or 1000 m), for example, we are usually talking about outdoor cameras, installed on walls or poles on the outer area of ​​the enterprise. Under these conditions, if cabling is metallic, it will act as a lightning rod, putting in risk the entire installed system being damaged at the first lightning storm. I experienced this situation many times in a company where I used to work, which was only remedied when we began to use only optical fiber for these situations. So my recommendation is: Avoid using metallic cabling to remote external cameras, when cables have to go through open spaces, especially in areas with high incidence of lightning. - Even if its cost is higher (cost of fiber + converters), the achieved economy and the headache avoided by not needing to break walls to pass conduit or install new gutters to run cables from the cameras, makes final cost and stress lower. Breaking point: When it's worth using fiber optic? There is no ideal solution that meets all situations. We should always consider what is the best type of cabling to be used. If your work does not fit into any situation commented previously, where the use of fiber optics would be almost obligatory, seek to examine whether or not there will be situations stretches where fiber optic would be more interesting. 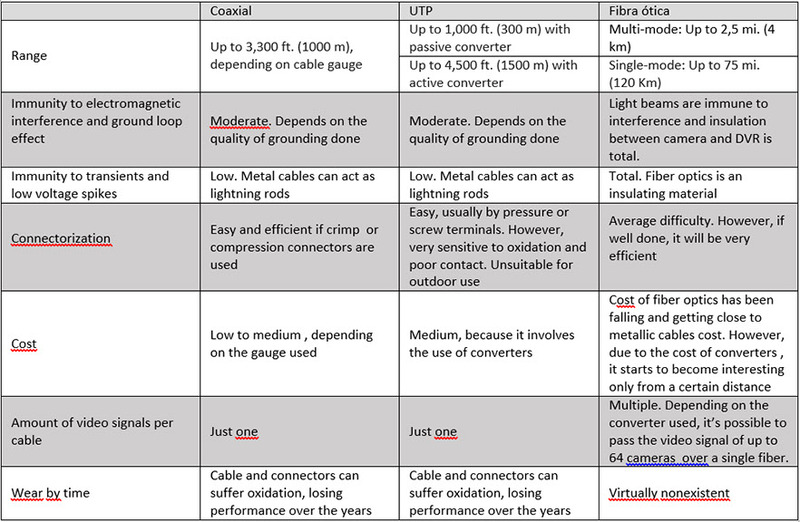 To make this calculation, try to analyze, for each camera, depending on the distance and type of cable (coax, UTP or fiber optic), the cost of cable itself, converters (except for the coaxial cable), infrastructure and labor. As fiber optics is less picky about infrastructure, you will realize that, from a certain distance (the breaking point), it will begin to be worth using fiber optic. Remember that it is not mandatory to use a single type of cable for all cameras and that, from the point where it becomes economically viable, optical fiber is always the best option. This was already mentioned mentioned in the table above, but deserves to be highlighted. Optical fiber is virtually immune to weathering, it does not rust and does not age as metallic cables. With the event of HD cameras, manufacturers are already providing coaxial cables and UTP converters specific to meet these cameras specs. It is certain that 4K resolution cameras will require even better cables. This means that in order to update a system, you need to replace all wiring, representing 80% of the installation time of a work. Due to the high bandwidth that it supports, it can be said that a fiber optic installation will take a long time to become obsolete. Simply replace the converters at the edges to make installation ready to meet the new technology. In my opinion, this is biggest advantage of fiber optics. Let's take the example of an intelligent building: coaxial or UTP cables are passed to CCTV system, cable for alarm system, UTP cables for data network; beyond the specific cabling for building automation and fire, which can be UTP or not, depending on the type of system used. If we spend only optical fibers connecting the different parts of the building, we wouldn't need to worry about the different types of cables to be passed, because what will decide which type of signal will be driven will be the fiber converters installed at the ends. In this case, versatility is enormous, as a single fiber can carry different types of information. There are converters that can send on a single fiber: video signals, bidirectional audio, network data, control / data (RS232 / RS485), telephone, alarm (input and output), etc. Thus, in a point that had only one access controller, you can start receiving the video signal of a newly installed camera, without having to spend a new cable. Simply replace fiber optics converter (or add a new module to the existing one). Depending on the project, initial cost may be higher, but versatility achieved with this solution, which easily meet any future expansion without the need for infrastructure works, certainly will compensate investment made.